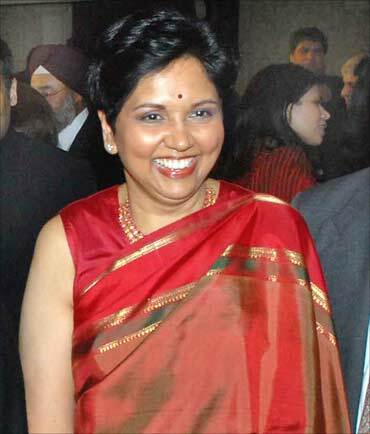 Indra Krishnamurthy Nooyi, Chairman, PepsiCo is one of the world’s 100 most influential people. Here are some words of wisdom from a business woman whom Time magazine has described as a ‘world class leader.’ Read on. • You give a team of people a set of objectives and goals and get them all to buy into it, and they can move mountains•Aim high and put your heart into it. • What’s important is trying to be the best and working to get there. And that’s how you fulfill your potential. • I’m putting my hand up and saying, ‘Able body, ready to work. I can scrub floors to address big issues. •Take a stand. Be known for your courage and confidence. • Success isn’t money, prestige or power because net worth can never define self-worth. True success is being happy with yourself, is being fulfilled. And that comes from devoting your time, your life, to doing what you love the most. • At the end of the day if I stand back and have regrets, it is never going to work. You just look forward and get on with life. • Don’t think of the difficult journey. Think, instead, of the wonderful destination. • We are too attached to the known security of the past and too wary of the challenging promises of the future. This often leads to complacency or inertia. • You’ve got to say, at every point in your life, if you were to drop dead, would your epitaph be something that you could be proud of? Is your legacy something that would linger long after you? • If there is (a glass ceiling), remember it is made of glass and it can be easily broken. All you have to do is try. • The best test is that I wake up every morning dying to come to work. • My parents and my grandfather taught me that when you do a job, you got to do it better than everybody else. Simple. You cannot let anybody down. • When you don’t have a safety net, when you don’t have money to buy clothes for interviews and you are going to a summer job in saris, all of a sudden life gives you a wakeup call and you realise that you have got to work extremely hard to make it happen for you. • As a child in India, my mother would ask a simple but compelling question: ‘What would you do to change the world?’ Today, my answer would be that I want to lead a company that is a force for good in the world. • We say someone is good company when we enjoy being with them. A good company creates that kind of enjoyment. In the process, it creates a strong sense of identity. People come together in pursuit of the same goals. A team is formed. • Being a good business starts with being a good employer. • Good candidates can pick and choose more between companies who make similar offers to them. The deciding factor is the kind of company that they want to work for. They are comfortable in societies with many cultures, they want to work flexibly. They are both more demanding and more in demand. They want success, but not at any price. They want to do some good in the world. • To be successful in foreign countries, you got to walk a mile in the shoes of those people; while in Rome, do as the Romans do. You retain your Indianness, but you also have to adapt to what that country needs. If you remain too isolated, you will never be successful. • The toughest thing about transformation is letting your best friends and people you worked with for years leave and go off on their own. • To attract the best people, we have got to create an environment where people can actually balance life. • In every change agenda, there is always going to be a percentage of people — like 10% or something — that are not going to agree to the new agenda. They are the casualties of the change. If they have to go, they have to go. • A good company offers employees a career, not just a job. To describe it as a career shows that we have an enduring interest in someone. They are not here today, gone tomorrow and thanks for what we could take from you. • You should never wait until somebody is ready to say goodbye to tell them how much you value them. • Ever since I have been in the work life, I have always used a simple rule: Whatever I did, I had to produce an output that was so much better than what somebody else did. So I would work extra hard at it. More hours, yes. More sacrifices and trade-offs, yes. This is the only journey I know. I don’t know what it is to have the cushy life and go home to watch the 6.00 news. • Leadership is hard to define and good leadership even harder. But if you can get people to follow you to the ends of the earth, you are a great leader. • As a leader, I am tough on myself and I raise the standard for everybody; however, I am very caring because I want people to excel at what they are doing so that they can aspire to be me in the future. • To be a CEO is a calling. You should not do it because it is a job. It is a calling and you have got to be involved in it with your head, heart and hands. Your heart has got to be in the job, you got to love what you do, it consumes you. And if you are not willing to get into the CEO job that way, there is no point getting into it. One of the most important things for a leader is to identify their own core competency. In my case, my core competency is my ability to be able to demystify any complicated problem. I continuously strive to enhance that core competency. • A leader must have the courage and confidence to stand up and defend his/ her ideas. • Effective communication is the key to success. Clarity and conciseness are critical for effective communication. I urge you to read speeches of great leaders like Abraham Lincoln or John F Kennedy to see how they were able inspire people. • Consistency is an important aspect of leadership since it helps build trust in those that follow you. Be honest in appraisals. If people aren’t performing well, help them ‘cross the bridge’ and get where they need to go by examining why they aren’t performing. Raise the bar as the boss. • Coaches or mentors are very important. They could be anyone — your husband, other family members or your boss. But you cannot pick them. They will pick you. • Don’t expect to be on the same promotional track as someone who works five days a week if you work three days a week. In less than ideal situations tough it out, try to change it and then leave even if it means not working for some time. • The minute you’ve developed a new business model, it’s extinct, because somebody is going to copy it. This entry was posted in Uncategorized and tagged CEO Pepsi, Indra Krishnamurthy Nooyi, indra nooyi, Indra Nooyi chairman Pepsi, Indra Nooyi's Management Mantras for Success, Pepsico. Bookmark the permalink.